A guide to how the war for control is waged upon us, and 4 ways to fight back. October 26, 2012 - The terms insurgency and counterinsurgency can quickly become confusing in a politically motivated context. However, generally speaking, an insurgency seeks to overthrow an established institution or political order, while a counterinsurgency seeks to maintain that order. In the United States, and around much of the world where the nation-state still prevails, the established order is one of national sovereignty based on constitutions and charters produced by each respective nation, with an infrastructure built and improved upon over generations by each nation's respective cultures, economic activites, and innovations. There is an insurgency to subvert all of this. A global corporate-financier insurgency, or simply a "corporate-insurgency." The corporate-insurgency seeks to subvert our institutions, starting with the family, extending to our schools, universities, churches, temples and mosques, our local sheriff, and even reaching into our national governments, rewriting or eradicating altogether our national constitutions and charters. It has, to a great extent, already subverted our independent local infrastructure, while implementing laws and regulations to prevent us from restoring it. We have the very tactics described in a vast library of government and military counterinsurgency documents being employed against us, where ever we are and to a profound effect. While this above quote is a most accurate description of an insurgency, as one reads the US Government Counterinsurgency Guide (2009), they will realize that the opposing methods of counterinsurgency itself involve all of these same factors, simply mirrored and reflecting the interests of the US versus the interests of targeted "insurgencies." 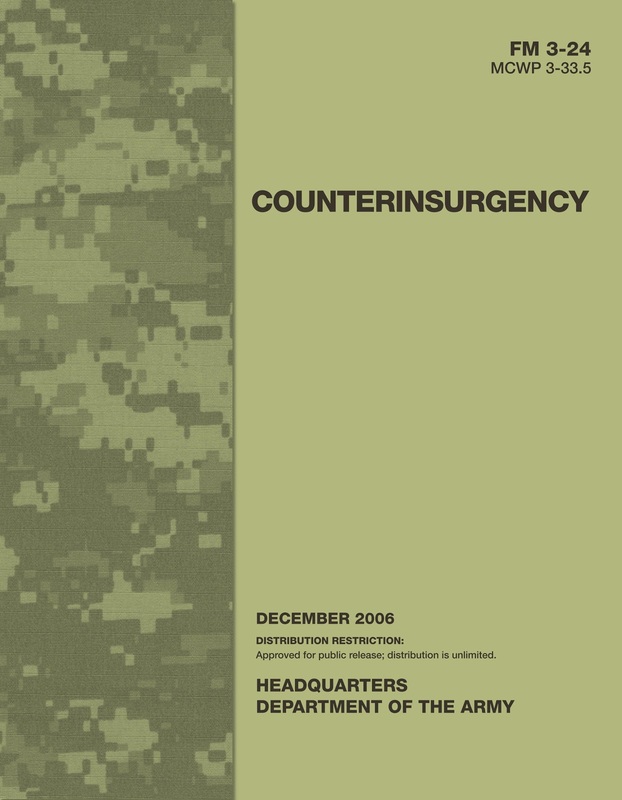 Image: The cover of the US Government Counterinsurgency Guide (2009) features the signatures representing the trifecta of modern day empire, covert operations (USAID), military force (Department of Defense), and system administration (the State Department). COIN describes the methods by which empire is implemented at a grassroots level. As a matter of fact, what is described by the 2009 counterinsurgency (COIN) guide, is an accurate description of how political control has been achieved and maintained by all governments throughout the entirety of human history - it also forms the foundation of modern empire. Understanding this is key to finding solutions when one finds themselves under the subjugation of an unfavorable political ideology or system. The tactics the guide describes can, and often are, used by either side in any political struggle, not necessarily only in an armed "insurgency." COIN is a socioeconomic-tactical synthesis, an interdisciplinary strategy based on an understanding of how a society functions, how to organize human resources to multiple force, and what needs and desires motivate individuals, as well as how these can be manipulated and controlled to collectively motivate a society. These more technical concepts are generally absent from everyday political discourse, and equally absent or incomplete in regards to finding solutions for a failing or unfavorable system. While the US Government COIN guide gives us a clear picture over the governmental-military interdisciplinary aspects of COIN, the Marine Corps Field Manual 3-24 (FM 3-24) provides us with a complete picture of the actual components of an insurgency and all the relating factors that affect it. This includes an enumerated list of services, institutions, organizations, and processes that must be controlled in order to establish political, tactical, and economic primacy. Without these, counterinsurgency fails. Without these, any political movement seeking to assert itself over a flawed or failing system, fails. While FM 3-24 deals with an armed insurgency, presumably in a foreign country, the basic concepts can and are applied to the execution of real political power throughout the world. The reason why so many well-intentioned political solutions fall short, is because they are tailored without understanding these basic concepts. 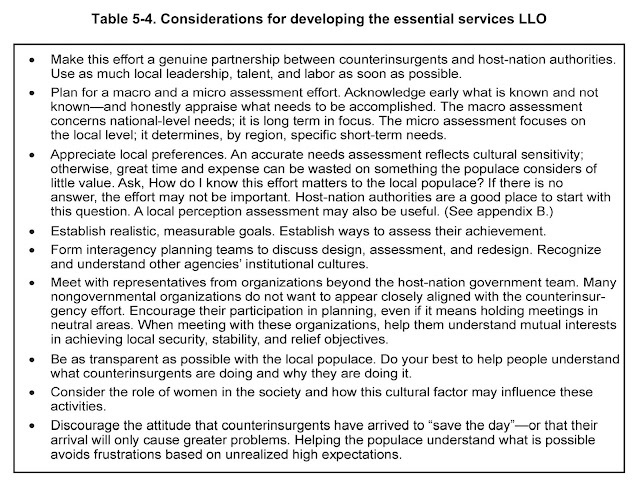 When attempting to establish political primacy - essential services, basic infrastructure, economic development and administration must all be controlled by the counterinsurgency. It is upon these basic aspects of modern society that people depend, and from which popular support is sustainably derived. Strength in arms alone will fail utterly unless these aspects are secured, controlled, and developed properly. Essential services address the life support needs of the HN [host-nation] population. The U.S. military’s primary task is normally to provide a safe and secure environment. 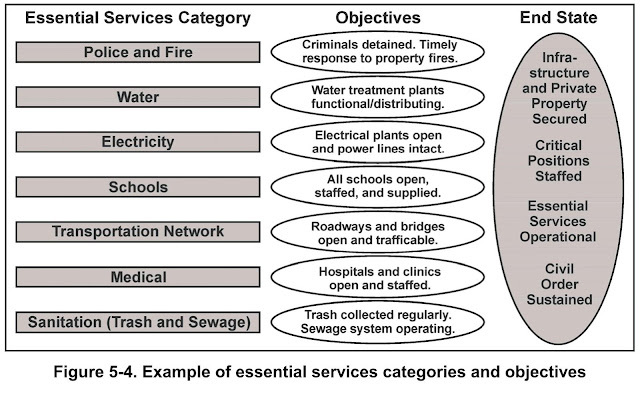 HN or interagency organizations can then develop the services or infrastructure needed. In an unstable environment, the military may initially have the leading role. Other agencies may not be present or might not have enough capability or capacity to meet HN needs. Therefore, COIN military planning includes preparing to perform these tasks for an extended period. Any goal, no matter how well-planned, noble, or progressive, cannot be achieved before these basic services are established and capable of being sustainably maintained. The military is a highly trained, disciplined, well organized institution capable of developing, maintaining, as well as protecting these services. In our local communities around the world, we have to ask ourselves how we can similarly develop and maintain these services sustainably. The task is not entirely as daunting as it may seem. Local communities around the world accomplish this through a combination of traditional and newly created local institutions. Most local communities around the world operate with the added advantage that the corporate-insurgency they face is low-intensity and generally not armed. For prospective activists, auditing what their communities already possess, and how to develop it to be more organized and effective would be a good first step. Many communities already possess the ability to do these activities on their own. Points such as "building an indigenous local security force" might translate into efforts to empower local sheriff offices to negate intrusive, unconstitutional federal government control. It might also include the establishment of professional neighborhood watches and shooting clubs where responsible gun ownership is taught. Building and improving schools might translate into expanding and improving local home schooling networks, leveraging freely available open-courseware online, and opening after-school tutoring centers giving remedial classes or teaching trades and skills not taught at existing educational institutions. Ultimately, most communities are not faced with absolute destitution. 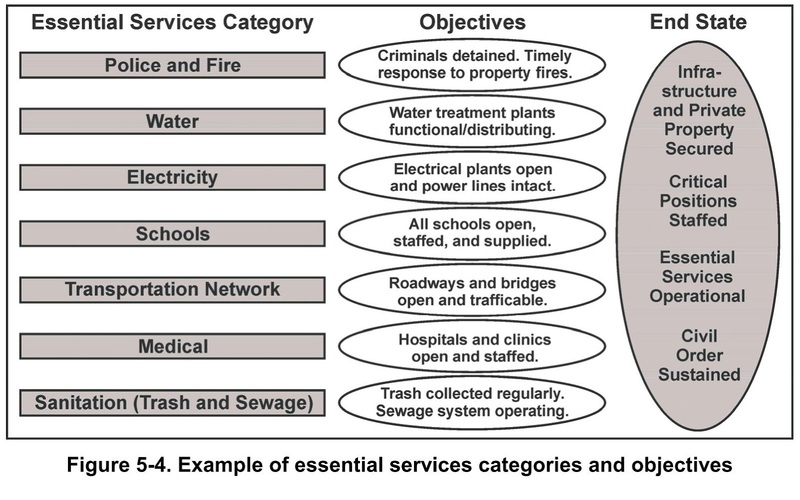 For the most part, basic services exist. The problem really is that these services are carried out in some cases by corporate-insurgents and play an essential role in building legitimacy and a support base dependent on the corporate-insurgency for these services. Therefore, the goal should be to take ownership over the execution of these basic services which can be done as a community effort or as a local, small business. The precept of "boycott and replace" is the equivalent of the "take, hold, and rebuild" doctrine in military "nation-building" and counterinsurgency. The short-term aspect concerns immediate problems, such as large-scale unemployment and reestablishing an economy at all levels. The long-term aspect involves stimulating indigenous, robust, and broad economic activity. The stability a nation enjoys is often related to its people’s economic situation and its adherence to the rule of law. However, a nation’s economic health also depends on its government’s ability to continuously secure its population. Without a viable economy and employment opportunities, the public is likely to pursue false promises offered by insurgents. Sometimes insurgents foster the conditions keeping the economy stagnant. Insurgencies attempt to exploit a lack of employment or job opportunities to gain active and passive support for their cause and ultimately undermine the government’s legitimacy. Unemployed males of military age may join the insurgency to provide for their families. Hiring these people for public works projects or a local civil defense corps can remove the economic incentive to join the insurgency. Clearly all of these industries are dominated by the corporate-financier oligarchs and their corporate-insurgency. One need not stretch their imagination here to see how the economic crisis created by corporate-financier interests across the West and spreading around the world is comparable to the sort of economic challenges facing a post-war nation fighting an armed insurgency. The description and redresses described on page 119 are particularly relevant, and if we consider the corporate-financier interests who have overtaken our government and institutions as the insurgency, we must see it within ourselves and our communities to search for the energy and initiative to begin local economic development. And again, where the military possesses the ability and the resources to do this on their own, or with other government institutions assisting - local communities must develop their own institutions to accomplish these same goals themselves. Hackerspaces and farmers' markets represent two organized efforts to develop economic opportunities locally, and present viable models that can be expanded into other industries. 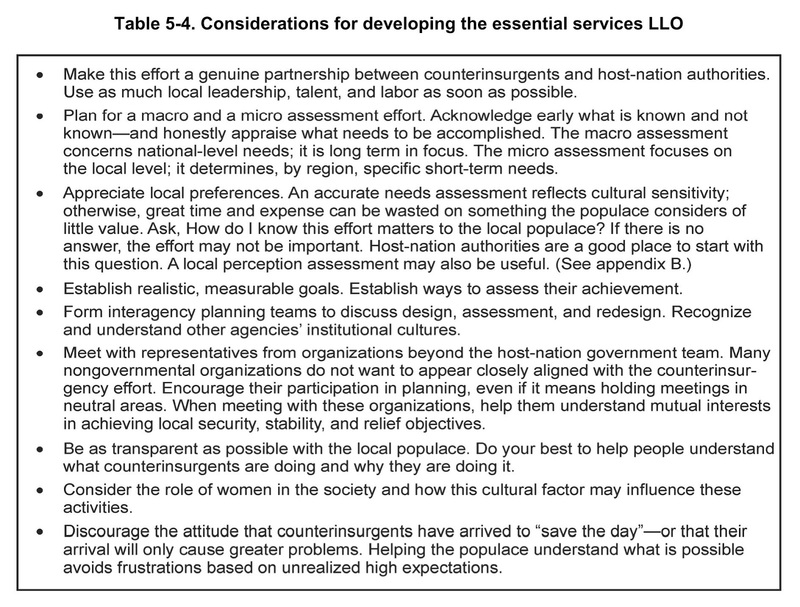 An entire section of the counterinsurgency field manual is dedicated to logistics. The importance of managing logistical lines not only enable an army to conduct counterinsurgency operations efficiently, but deny the insurgency supplies to conduct their operations. As it is pointed out, throughout history, insurgencies many times supply themselves off of carelessly protected counterinsurgency supply lines. Insurgents have a long history of exploiting their enemies’ lines of communications as sources of supply. During the Revolutionary War, American forces significantly provisioned themselves from the British Army’s overindulgent and carelessly defended logistic tail. In the 1930s, Mao Zedong codified a doctrine for insurgency logistics during the fight against the Japanese occupation of China. Without exaggerating, Mao stated, “We have a claim on the output of the arsenals of [our enemies],…and, what is more, it is delivered to us by the enemy’s transport corps. This is the sober truth, it is not a jest.” For Mao’s forces, his enemy’s supply trains provided a valuable source of supply. Mao believed the enemy’s rear was the guerrillas’ front; the guerrillas’ advantage was that they had no discernable logistic rear. This relative lack of logistic capacity was not an insurmountable problem for Mao or one of his logistic theorists, Ming Fan. According to Ming, “Weapons are not difficult to obtain. They can be purchased from the people’s ‘self-preservation corps.’ Almost every home has some sort of weapon that can be put to use.… Ammunition can be obtained in the following ways: (1) From supplies given by friendly troops and headquarters on higher echelons. (2) Purchased or appropriated from the people. (3) Captured by ambushing enemy supply columns. (4) Purchased undercover from the enemy army. (5) From salvage in combat areas. (6) From the field of battle. (7) Self-made. (8) Manufactured by guerrilla organizations. (Such items as hand grenades, ammunition, etc. )” Beyond these specifics, this doctrine prescribes a mindset of actively seeking parasitic logistic relationships with not only the conventional enemy forces that the insurgents seek to co-opt and defeat but also active linkages to local black market activities and the cultivation of host-nation sympathizers. For these reasons, forces conducting counterinsurgency operations must protect all potential supplies. Forces must also vigorously protect their lines of communications, scrupulously collect and positively control dud munitions and access to other convertible materiel, and actively seek ways to separate insurgents from black market activities. The corporate-insurgency's logistical lines are particularly easily to compromise - that is because we the people are their logistical lines. The corporate-financier oligarchy sustains itself from the collective patronage of communities around the world failing to develop local institutions, services, and economies, and instead pay into centralized, monopolizing multinational corporations. By boycotting and replacing these multinational corporations, we cut the corporate-insurgency off entirely from its logistical lines, starving it into submission. But just as the USMC COIN manual implores counterinsurgency planners to secure their logistical lines from pilfering insurgents, the corporate-insurgency uses laws and regulations to protect their lines. Laws and regulations are designed to prevent independent local institutions, services, and economies from springing up and competing directly with the corporate-insurgency. Farmers in America have been fighting laws seeking to disrupt and regulate out of business, local farmer's markets. Similar laws in regards to "intellectual property rights" seek to stifle the emergence of independent technological innovation and personal manufacturing. Understanding the greater implications of these laws should provide us a greater impetus to organize and find the means of circumventing them. For local communities organizing against the corporate-insurgency, our "supplies" consist of our food and water, our electricity, our means of communication, and many others. To secure these, we must assume ownership over them, maintaining them as a collective common or a small, local business. To organize against the corporate-insurgency when we are still dependent on them for even simple things like food and water, is a recipe for instant and repeated failure. In a very literal sense, a local community's communications include telephone networks, the Internet, and radio. Like many other aspects of fighting the corporate-insurgency, the low-intensity nature of it affords us the ability to piecemeal boycott and replace various aspects of its power structure without disrupting the lives of people in our local community. In terms of communication infrastructure, ad hoc wireless networks could be constructed to connect a local Internet. This is already being done by the US State Department to infiltrate and overthrow sovereign nation-states - they already recognize it as an essential strategy of the corporate-insurgency. The Obama administration is leading a global effort to deploy “shadow” Internet and mobile phone systems that dissidents can use to undermine repressive governments that seek to silence them by censoring or shutting down telecommunications networks. With a well developed community Hackerspace, a similar network can be created for a local community to simply circumvent and replace corporate-financier monopolies, providing custom tailored services for a community its creators already know, and spreading the profits of communication monopolies across local communities worldwide - a redistribution of wealth done not through socialist handouts, but through innovative local entrepreneurship. A larger international Internet could be made by simply providing links between communities. The Syracuse Community Broadband Initiative (SCBI) has received a $15,000 grant to explore the economic viability of building a state-of-the-art, fiber-optic broadband network for Syracuse. The SCBI seeks to provide cable, Internet and phone service to residents and businesses. The network would operate like a public utility committed to the best service at the least cost, and would operate from subscriber revenue independent of taxpayer subsidies. The network could provide a much higher connection speed than is currently available. It would have the capability to deliver an unlimited number of on-demand channels, including high-definition broadcasting and video conferencing for every subscriber via Internet Protocol television (IPTV) technology. It could deliver a vastly superior product at a much lower price. Our local communications infrastructure is crucial to the social, economic and democratic health of our community. It is equal in importance to our public roads, schools and utility services. We are foolish if we, as a community, do not take the lead in securing public control of, and access to, our communications network. It is not only possible and beneficial to develop local communication alternatives, but an absolute necessity in order for people to reassert themselves in a failing and unfavorable political system. Communication also includes the media. In this regard, the corporate-insurgency is already suffering serious defeat. It is finding it increasingly difficult to maintain primacy over the political narrative, or maintain popular support. When countering the corporate-insurgency, every bit makes a difference, and starting a blog, Twitter, or Facebook account with the expressed purpose of informing others of what is going on locally, nationally, and internationally is both free and easy to do. Even if the goal is to simply repost articles others write - these efforts combined with others already active will make a significant difference. How far a media project goes depends solely on the amount of time and effort one spends investing in it and the standards of objectivity and intellectual honesty one holds themselves to. The alternative media is a perfect example of a new "institution" and form of activism that has already successfully begun to counter the corporate-insurgency, and it does so by leveraging technology that allows us to do as individuals what was once only possible with large, capital intensive organizations. The alternative media also reflects some of the tactical considerations expressed by the USMC COIN field manual in regards to logistics. By using large corporate-owned, free services like Blogger, Facebook, Twitter, YouTube, and others to spread a constructive message aimed at developing our local communities, and against the corporate-insurgency, we are essentially exploiting their own logistical trails for our cause. It must be understood that while, without taking these basic aspects into consideration a political movement is sure to fail, this does not by any means negate the work of activists focused in other areas. A synergy must be created between all efforts aimed at unwarranted corporate-financier influence - but these fundamentals must be understood by all involved. It must also be understood that not everyone employed or involved in a large corporate-financier, multinational corporation is a bad person. In fact, many people who work for corporations like Lockheed Martin, Boeing, Halliburton, Exxon, and even Monsanto or Cargill are hardworking and incredibly talented. Like many military who leave the service and join the cause of humanity, these people can become some of our most valued allies if and when they realize the greater implications of what they are involved in and what, for their own best interests and those of humanity, they must next do. For our part, we must work hard to develop our local communities, to create tangible solutions to the problems we face, superior local alternatives to replace the dependency that empowers our opposition, and produce a viable model that is self-evidently a system people will want to join and help build. Of all the aspects discussed in the voluminous collection of counterinsurgency manuals the US government has produced, possessing a morally superior cause and instilling a sense of legitimacy within a population ranks toward the top in importance. Building a local community with the people's best interests addressed by the people's own two hands themselves, exhibits just such a cause, featuring just such legitimacy. It would be a movement very difficult for the corporate-insurgency to prevail against, and is the key reason why their doctrine has failed them overseas in pursuit of their empire.